Educational music, toys, instruments and CDs are a great way for Toddlers and Preschoolers to develop and learn from listening to music. Listening to music helps toddlers speech and their movement, it also benefits their self-confidence and self-expression, and helps them to listen and concentrate. Music aids the development of speech, and singing simple songs teaches your child how language is constructed. Songs or chant repetition can teach your child the basic structure of spoken language. Music builds their vocabulary and offers children a way to explore a whole range of moods and emotions that they can identify with, but can't put into words. Action Songs help your toddler experience music physically through play, and is great way of interacting between you and your toddler. Your child won't know that they are actually doing an educational music game, it's all just good fun to them. Actions songs allow children to take part even when they can't sing all the words, and there are many simple action songs that just involve you singing and clapping while your toddler imitates your actions. This type of activity helps to develop gross motor skills as well as expanding their vocabulary. An action song can even change both of your moods, making you both happier and content. My personal favourite for changing my mood is "Johnny Taps With One Hammer," it just makes you laugh. But please don't worry about your singing skills... Your child will respond to your enthusiasm and vibe, not how it sounds, they are not the X Factor judges. If you are worried about singing, or you need some help rembering some of the songs you used know as a child, why not buy an Action Songs CD. Children love listening to music, and the younger they are, the broader their taste will be. You can go to the library and get a range of different music, so you can find out what music makes your toddler tick, and then make up your own educational music game to get your child more involved. At this age music is an adventure. Learning to listen to and appreciate music is a skill that can help your child's development in many areas. It can improve their listening skills and their concentration, but don't sit them down ready to concentrate on music, or force it on them, this will probably have the opposite affect. Recognising the difference between loud and quiet, fast and slow. Keeping track of the beat, and recognising different rhymes. Learning the words to simple songs. Developing the co-ordination needs to play simple instruments. Learn to co-operate with other children. 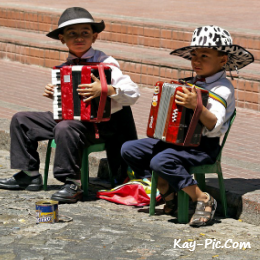 Every child should have a few basic instruments so that they can experiment with music as they wish. A child's concentration span can be very short, so if they are enjoying a piece of music, they may well express this in the only way they know how, at this age through movement. The benefits of regular dance sessions are endless, offering your child the chance to be creative, as they develop their gross and fine motor skills. Dance will help them to work together with other children, build relationships and gain self esteem. As with singing songs, dancing to musical tapes will help with their language learning, and get your child used to the rhythm and tune. There are some fantastic tapes to get you moving! One of our nursery's favourite educational music game is The Sticky Kids CD's, but don't think that it's just for kids. You have to put in 100 per cent of energy and exuberance. Make a musical activity part of your toddler's day. And most of all enjoy it.